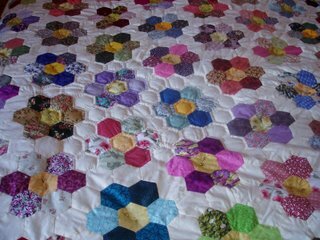 This is another view of the quilt from the side of the bed. This photo shows the small area where I have begun to hand quilt each hexagon. It's not particularly hard work, just awkward because of the large ring I am using to hold the quilt taut while I quilt. The quilt measures 11 feet x 10 feet in total with each hexagon measuring 2 1/2 inches across. Looking REAL good Viv....it will be truly beautimous when finished. Looking forward to watching your progress and ultimately the FINISHED! TA DA! oh this is beautiful!!! wish I had the time and patience!!!! What an amazing quilt. A real labour of love. You know what? It's bigger than my living room! Seriously!